Before I fill you in on how I spent my Saturday, let me apologize for the "Free Stuff" posts that appear directly beneath this one. See, every year I round up and post a lot of the manufacturer's rebates. No, not out of the goodness of my heart to try and save you money, but rather as a cheap way to get traffic to my site. You'd be surprised how many people show up over here by searching for "Berkley Line Rebate" or "I Want A Crappy T-Shirt Rebate" over the course of the year. Rather than spread these posts out over several days, I figured I'd get them out of the way all at once. So if you like 'em, enjoy. If not, F-off. We did most of the buying online, and then I ended up going in and doing a tiny more haggling in person, before driving off with the new wheels. This is the 2nd car we've bought online, and I'd totally recommend it, especially if you're not bothered by driving a little bit to that dealer that gives the best price. Now I just gotta break her in. Stick the rod holders in the new windows, drop in the all-weather mats, program the GPS to all the not-so-secret locations, and head toward gravel roads and riffles. Do I smell a road trip? Spring can't come soon enough. good stuff & congrats! I have the exact same Subie, 2.5x Premium but a 2010 (duh, bought it a year ago). Stick shift? Congrats on the new ride! Just thought I'd mention that every time I come to your blog I get a pop up for Google Chrome. Not sure why as I have my pop up blocker on. Kelly and I just joined the Subaru club too with the new Outback. We're very much looking forward to our road trips. The first one will be in two weeks for some deep south bassin' with kayaks strapped to the top. Michael, Michael. Cheapo crap is one thing, but cheapo women? Forget the crap. Looks like a good troutmobile! My bronco does a good job getting back to even the hardest to access spots, but I can't afford to feed it lately... Come on spring! Cool. Mine's an auto, but it's got that tap shift feature if you want to be in control of the shifting. Huh, I'll look into that. You use Internet Explorer, right? My house uses Chrome & Firefox and don't have the issue. It might be some code I added to help the page load faster in Chrome environments. Congrats to you on the Outback. My MIL is on her 2nd Outback and she loves them. I'm still looking for the lady that comes with a mail in rebate. By the way, don't know about yours, but ours was built in the Indiana plant that is supposedly zero landfill waste. So, it's built by American workers and it's (relatively) environmentally friendly. I thought that was pretty cool. Congratulations, Mike, on your new fishmobile. I have owned (2) Outbacks, driving one currently, and love them. 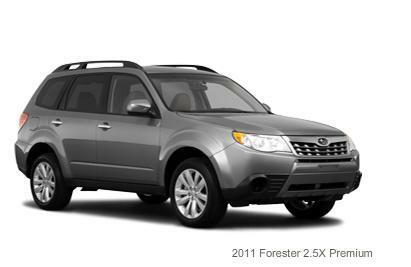 The Forester will make you happy for years to come. That looks like a great trout mobile and if you need help breaking it in just swing by and pick me up. 18 months ago, I intended to buy an American made truck. But when it came down to it, it was $26,000 for a new American truck (made in Mex, assembled in USA) that would go for MAYBE 150K miles or $30,000 for a new Toyota (made and assembled in the USA) that I know will last for 300K+ miles. If the accelerator doesn't stick, and I don't run into a jersey barrier, at least. The bad part is it's still a truck.....24mpg HW, and 16 (or less) city. The Chevys & Fords were running about 1mpg higher. And yeah, I owned 3 4WD subaru wagons from the pre-outback days (1981, 1983, 1989 models). All had flaws, but all ran to over 300K miles and ran on hard beach just fine......esp. compared to a 2WD ford ranger. And yeah (sorry for 3 comments), the Google chrome popup is muy annoyomoso. Congrats on the new ride. Those Subarus sure seem to have peoples hearts. I must get one! Now jack it up up nobby mudders and add a brush guard.